I am currently in the process of polishing off my very first book of knitting patterns, but that's not going to stop me from self-publishing my own individual patterns! Here's one that snuck out of its tank late-ish last night - so late, in fact that it probably slunk right past you and you didn't even see it! All that aside, please meet the OctoMitts. You might not want to start shaking their hands - these ones have got a LOT of arms, and you could be here all day..! 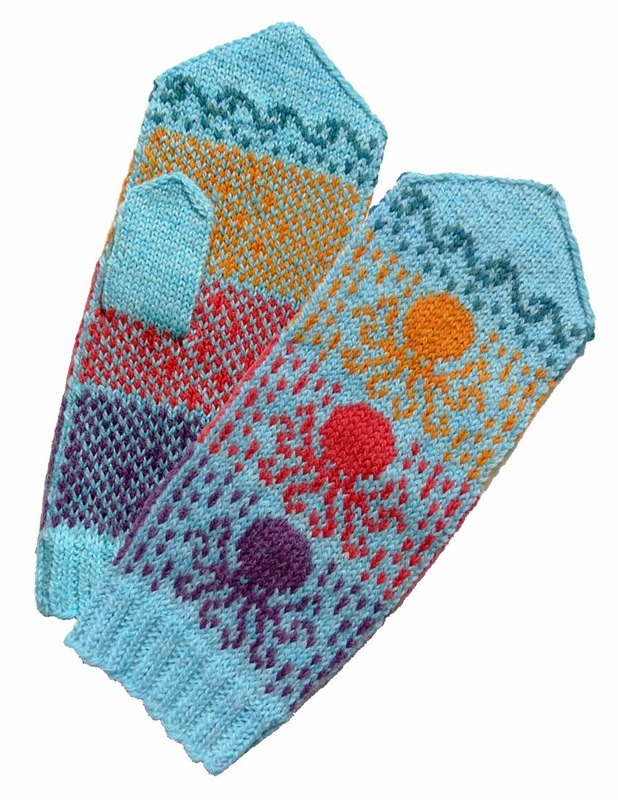 These mittens (and fingerless mitts) feature three jolly octopuses (that’s the correct plural,) bobbing along singing a song at the bottom of the (beautiful briny) sea. Want to join them for a dip? They’re all arms! Never knit colourwork before? Since these mittens only use one contrast colour per round these ones would be a great place to start! You can get your (ahem,) MITTS on the OctoMitts pattern here on Ravelry and here in my Etsy shop. Oh, speaking of my Etsy shop, I should also mention that all my patterns there are now available as instant downloads. What a world it is that we live in! Now, who's up for seafood? February 10, 2014 at 2:57 p.m.
February 11, 2014 at 6:28 a.m.